Home › book review › Kat Promotes Mice! 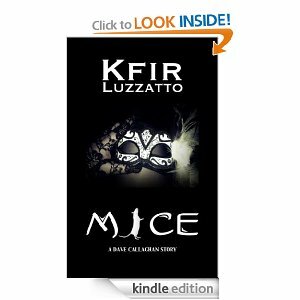 The IP Kat has given a nice plug for Kfir Luzzato’s new book MIce, available here. I knew cats like mice, but nevertheless find this development amusing. Dr Kfir Luzzatto is, of course, a veteran Israel patent attorney. He is now having a second career, or at least a good sideline, as a novelist. Here is an extract from the book: “Where the hell are they coming from?” When Frankie asked a question, it always sounded like he was placing the blame on someone—me, in this case. Instead of answering, I squashed the white mouse that had just climbed out of his coffee cup. The mouse had the consistency of putty and felt like it; no bloodshed was involved in the squashing. This Kat is impressed at Kfir’s output and wonders whether being a patent attorney is perhaps an excellent training for anyone contemplating writing fiction. Merpel is however concerned that, when any patent attorney turns his hand to literature, the description of his output as “horror” should not extend to the claims contained in his patent applications. I cannot comment on Kfir’s literary style since the above sentence is all I’ve read of this book. Personally, I am not a great fan of the horror genre. I actually enjoy 19th century English romantic literature. I suppose I could comment on Kfir’s claim drafting style, or at least that of Luzzatto originated patents that I’ve seen. (There are even a few that I worked on at the start of my IP career, where my first six-months were spent working for L&L). If I am not mistaken, Kfir drafted the voluntary code of ethics of the profession under which Israel Patent Attorneys are allowed to critique specific applications or patents, but not to deride fellow practitioners. This is generally good policy since sometimes the patent application as filed reflects client’s insistence, low budget and other considerations. It occurs to me that a short story written in the style that attorneys reserve for claim language would make quality comedy. It could include, for example, such gems as “ground engaging rotary propelling device” instead of “wheel” (re. Gedaliahu Finezilber) and other examples of the routine abuse of the English language found in patent applications (especially those translated from the original French – which earn criticism even from the USPTO examiners).